The golf course of the Country Club of Buffalo is a unique 1926 Donald Ross creation that makes full use of the Onondaga Formation, a limestone escarpment that stretches from New York to Detroit. To make things even more interesting, Ross routed the course through and around an old limestone quarry. Six holes are incorporated in the quarry and three holes are routed on the level below the escarpment and this gives Buffalo two discreet signature holes. The first of which is the one-shot pulpit 6th, a hole that will remain lodged in the memory forever. The offset green is perched on a high mound and you are faced with little margin for error with your tee shot. The second “signature” hole is the 415-yard 18th and it makes a fabulous finale with the home green wedged below a natural rock garden that leads all the way up to the clubhouse. The Country Club of Buffalo played host to the 1931 US Women’s Amateur and the 1950 Curtis Cup, which the USA team won comfortably, beating Great Britain & Ireland 7½ 1½. The Country Club of Buffalo was established on February 11, 1889 and has been very instrumental in the history of "The Queen City" and early golf in the United States. Polo was played on Club grounds until 1935. The first golf hole in Western New York was pioneered at the Club's first location in 1894 as club members placed an empty tomato can in the ground. In 1899 the Club moved to make way for the lavish Pan American Expositions. The new course was ready for play in 1902 and Walter J Travis revamped the course in 1910 and 1911. Travis could be considered the first "US Open Doctor" as the Club hosted the 1912 US Open won by John J McDermott for his 2nd consecutive victory in the Championship. McDermott's bid for three in a row ended the next year at The Country Club in Brookline, Massachusetts. Amateur Francis Ouimet stole the show in a dramatic playoff win over renowned Open Champions Harry Vardon and Ted Ray. The Club acquired property in 1922 for its current location in Williamsville. Legendary golf architect Donald Ross designed the course that opened for play in 1926. The Ross designed course has been preserved with enhancements made by such notables as Robert Trent Jones, Geoffrey St. John Cornish, and William Craig Schreiner. Ross created a masterpiece as the Club is positioned on the Onondaga escarpment and holes are weaved around and through a limestone quarry. The US Women’s Amateur was played on the new course in 1931, and the Curtis Cup was contested in 1950, with the American women defeating the British. 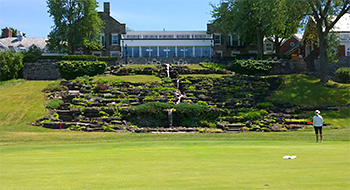 The Carling Cup Matches between professional and amateur teams from the U.S. and Canada were held in 1960, and in 1962, the National Junior Girls Championship was played at the Country Club of Buffalo. I had the opportunity to play this storied club in early June. The course has four sets of tees that measure 5,537 yards from the green tees to 6,852 yards from the black tees and plays to a par of 70. The course is dotted with about 110 well placed bunkers that challenge the tee shot and protect the undulating greens. I thought the recent work on the bunkers has made them some of the finest I have seen. The greens, fairways, first cut of rough. and second cut of rough were all maintained magnificently. The tees were just aerated when I played and they were also excellent. This review will be based on the distances from the blue tees that measure about 6,400 yards. The front nine has 6 par fours that range in distance from 301 yards to 475 yards. They are all challenging and one of my favorites was the short 301 yard fifth hole that is protected on the right by the limestone quarry with a classic crowned undulating Ross green and of course well placed bunkers. The 2 par threes are 167 and 207 yards. The 167 yard fifth green is elevated in the middle of the quarry and is one of the most unique holes I have ever played. The lone par five on the front is the 475 yard double dog leg seventh that is a good birdie opportunity with well played shots. The back nine has 6 par fours that range in distance from the short 315 yards 10th to the 436 yard 17th. Two of my favorites on the back were the dogleg right 404 yard 11th with its well placed fairway bunkers on the right and an elevated green that utilizes the elegance of the limestone quarry. The other is the 401 yard 18h that has a unique waterfall water hazard left of the green while the majestic clubhouse towers over the massive natural rock garden water hazard. The 2 par threes are 156 and 173 yards. The 156 yard 12th has a pond fronting the green while the quarry again frames the elevated green. The 173 yard 16th has a very difficult undulating crowned green and is protected by 5 bunkers on the right and left.